Photovoltaic solar panels at KEØOG power my ham station plus several lights in the house. I've been adding to the system over the years. My original panel is the Arco 33-watt unit at the very left. I just wrote a post about powering your HF radio or VHF mobile radio. The two basic ways are with a deep-cycle battery or with a standard plug-into-the-wall power supply. So what do I use? Primarily solar power. The solar photovoltaic panels shown in the image above collect about 250 watts peak. These are connected to serious 12-volt absorbed glass mat (AGM) deep-cycle batteries designed specifically for solar-powered systems. These batteries were seriously expensive and last about a decade, perhaps more. I have a small 12 vdc to 120 vac inverter right at the batteries that powers several lights in the house. From the main batteries I run 20-gauge line to a “repeater” battery under my desk. That battery is a Walmart “marine” deep cycle battery, which will last about three years (I’m now on my third). Why the repeater battery? Simple: My station is too far away from the main batteries. I’d have to run humongously-thick cables to power my rig. So, I power it from a nearby battery, which gives me lots of current during transmit, and when I’m not using it, it’s being recharged by the main solar system. Works like a charm! The only disadvantage is that my rig then sees the diurnal voltage cycle: down to 12.5 to 12.7 volts in the evening, and up to 14 volts during the day. This is rather hard on the repeater battery, so I simply buy an inexpensive ($58) marine deep cycle battery from Walmart, knowing I’ll have to replace it in about three years. RigRunner 4012 power distribution strip that distributes the 12 vdc solar power in my station. Note the use of standard connectors. One thing I didn’t mention in my last post is that the 12 vdc needs to go to several pieces of equipment. I use a RigRunner 4012 power distribution strip. As you can see, there’s plenty of room for growth. I really want to put in a plug (no pun intended) for these genderless, standardized connectors. If all your rigs and all your power supplies use these, you can interchange at will, often with other hams who have the same type connector. That’s a whole ‘nother subject, though. I power my APRS station, consisting of an old DSP-232 TNC and an ICOM IC-2100 2-meter mobile rig, with a commercial power supply, in this case an MFJ-4225MV. Why not use the solar system? That’s because the APRS station is on the air 24×7 and the total power drawn could actually exceed the capabilities of my photovoltaic system during winter. I can use the PV system for my other rigs because they aren’t on the air all the time. So how does it work? It works great! The solar recharge system ensures my batteries are always topped off. I did the math once and figured I could be on the air for more than three days straight (no sleep) and still not exceed the capacity of the system. It just works! I mentioned that the repeater battery lasts about three years. When it’s good, the voltage at the station is 12.7 vdc (fully-charged) down to about 12 vdc (half-discharged, but that would take lots of operating). But there comes a time when the voltage drops seriously on transmit, causing my Ten-Tec Jupiter to behave weirdly. The failure of the local battery seems to come on suddenly. This last time around, as soon as I had the symptoms, I disconnected the repeater battery, put it in the car, went to Walmart and exchanged it for a new one, brought it home, reconnected it, and everything’s copasetic. Oh, I also added an “expanded range voltmeter” to the system so I can glance at it to see how the local repeater battery is doing. If you’d like to learn more about how my station works, drag out the April, 1996, issue of QST and look at pages 33 through 37. 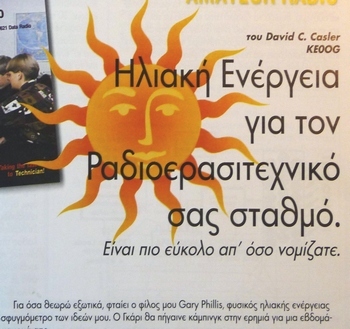 That article, “Solar Power for Your Ham Station—It’s Easier than You Think,” was translated into Greek (yep, literally—see picture) for the Grecian equivalent of QST. The only part of that original PV system still in use is the Arco 33-watt panel at the very left in the picture at the top of the page. This entry was posted in Ham Radio blog entries, Product Reviews and tagged Arco solar panel, DSP-232, ICOM IC-2100, MFJ-4225MV, photovoltaic power, pv power, repeater battery, rigrunner 4012, solar power. Bookmark the permalink. I use a standard html trick of a slashed zero. Sometimes it isn’t displayed properly. IS it just me, or is every1 seeing it this way…? How come your callsign (from, eg, dCasler.com) appears (via browser Comodo IceDragon) on my Window 7 based laptop as “KEØOG”? Have thought about a lesson on “end fed antennas”? Duplex. No common area. Pretty nice size back yard. Rules say”no antenas or tv antennas or tv satellite dishes. I’m looking for a dual band vertical to build for our new QTH. A inductor between 2 aluminum poles to give 15/40?? The repeater wire is 12 gauge. Did you really mean 20 gauge wire for repeater battery, or 2/0 wire? I happen to read your article. This sound greatly great. Where can I located the electric components to build the photovoltaic system? I’ m in Florida with a lot if sunshine and I want to turn that solar energy into power to run my Kenwood TS-820S transceiver system . Your assistance and guidance will be greatly appreciated.